Guernsey States Members' Conduct Panel said there was no prima facie evidence to back the complaint. Guernsey health campaigners are objecting to a delay for local patients being offered drugs approved by UK health agency NICE (the National Institute for Health and Care Excellence). Mike Read, from the group Health Equality for All, says President of Health and Social Care Heidi Soulsby made promises in the States in December that had not yet been delivered about their availability. Health and Social Care said it was currently reviewing the viability of supplying NICE-approved drugs to islanders but Mr Read said he was concerned that patients were still missing out in the interim. Director of Public Health Dr Nicola Brink disagreed that there had been a delay in the review and said that, at the moment, individual funding requests were considered as quickly as possible. The States will meet teaching unions next week after member said they were planning eight days of strikes. The National Education Union said walk-outs were being planned over four weeks in May as part of the ongoing pay dispute. The union says the board which sets civil servants pay was effectively giving teachers a pay cut of 3.5%. The Chamber of Commerce said the States needed to offer free childcare to parents who had to give up work to look after their children as a result of the action. The States said it recognised the "potential disruption" of the planned industrial action and added that it was asking the union to reconsider its decision. 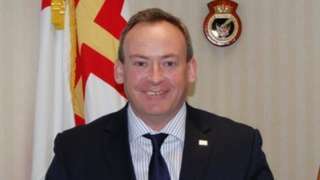 The Guernsey policy committee vice-president said he was "confident" he had always adhered to rules. Some late sunshine on Wednesday evening, then staying dry overnight with mostly clear skies. Breezy though with a fresh easterly wind. Minimum temperature: 8 to 11C (46 to 52F). Thursday will remain dry and bright with periods of sunshine, but the brisk easterly wind will persist. Debate has been sparked in Guernsey after suggestions a tree in Trinity Square should be felled. St Peter Port Constable Dennis Le Moignan said the tree's roots were causing problems on the road, drainage and a pump, as well as damaging cars parked in the area. Some islanders have said the tree should stay and another method should be found to sort the issues which would cost more. Mr Le Moignan said people should not have to foot the bill for a tree that belonged to the States and said he planned to approach the States to discuss the matter. Jersey's planning minister has disagreed with the previous planning minister about plans to develop houses in St Peter's Village. Current minister John Young has stood against the scheme, saying it would be against the agreed blueprint for the island's future development. Deputy Steve Luce had suggested moving the site for the homes. But Deputy Young said it would mean even more greenfield land being used and he could not support it. The matter will go up for debate in the States. The senior constable for the Vale has reacted angrily to news that 154 houses could be built on a residential site on Saltpans Road. A development framework for the Saltpans area has been released and islanders have 90 days to give feedback to planners about the idea. But Richard Leale said it was simply not an option for the area as it was "far too many houses in far too enclosed a space". St Sampsons Deputy Carl Meerveld also said infrastructure such as road and sewage networks needed to be looked at in detail before passing the plans to ensure they were were not overwhelmed. The States said the number of homes was in keeping with the density of housing in the overall area. A Code of Conduct complaint has been made against a member of Guernsey's senior political committee. The Bailiff's office has confirmed Deputy Lyndon Trott, vice president of the Policy and Resources Committee, was the subject of a complaint submitted on Tuesday. Deputy Trott responded, saying he had not yet seen the detail of the complaint but could say with "absolute confidence" that throughout his entire political career as a deputy has always adhered to both the letter and spirit of the States Members' Code of Conduct. The independent States Members' Conduct Panel is to determine whether there is enough evidence to support the claim. A Jersey business group says it fears local companies are suffering during the ongoing pay dispute between teachers and the States. Members of one Jersey teaching union, the NEU, are planning to strike for eight days in May. There have been a number of other walk-outs recently. The chamber claimed working families and businesses had been bearing the costs of strike action and it was worried parents were struggling to take time off without pay to care for their children during the strikes. Quote Message: If the groups can't deal with this, then maybe we should be looking whether the government might be able to put on some free child care for the days that these things are happening. There are many, many of our members who either will take holiday, or if they don't take holiday, you're looking at a issues around child safety where people are going to have to leave kids at home alone. That's not something that we should be looking at." If the groups can't deal with this, then maybe we should be looking whether the government might be able to put on some free child care for the days that these things are happening. There are many, many of our members who either will take holiday, or if they don't take holiday, you're looking at a issues around child safety where people are going to have to leave kids at home alone. That's not something that we should be looking at."